Hypertension in pregnancy is actually common in pregnant women. Approximately 10 percent of pregnant women experience this condition during pregnancy. With proper care, hypertension will not develop or harm and will disappear after birth. However, if left unchecked, can lead to hypertension praeklamsia conditions accompanied the presence of protein in the urine. A woman is said to have hypertension in pregnancy if blood pressure above 140/90 mm Hg. There are several types of hypertension in pregnancy, such as chronic hypertension, chronic hypertension with praeklamsia, gestational hypertension, praeklamsia and eclampsia. If hypertension occurs before you are pregnant or five months before pregnancy, then the condition is called chronic hypertension. Most women do not know that they are experiencing chronic hypertension because it does not cause symptoms. Without realizing it will carry over when you are pregnant. It is a chronic condition in which hypertension is not treated properly or has deteriorated so up until now pregnant. Protein is also found in your urine. You have hypertension this type when your blood pressure increase after five months of pregnancy. There is no protein in the urine or signs of damage to the organs in the body when you are suffering from gestational hypertension. The three conditions mentioned above could potentially turn into preeclampsia, especially if not handled properly. This condition is the presence of high blood pressure which causes damage to organs in the body and the discovery of protein in the urine. This condition usually occurs after five months of pregnancy. Signs you get into this stage is to feel an unbearable headache, abdominal pain upper right side, nausea, vomiting, shortness of breath, vision faded, decreased amount of urine, decreased platelet levels, or liver is not functioning properly. Eclampsia occurs when pregnant women with the condition praeklamsia seizures. These are the worst conditions associated with hypertension in pregnancy. Praeklamsia more likely to occur in women who are pregnant for the first time, contain at a young age (under 20 years) or containing at old age (over 40 years) , has a mother (biological or in-laws) or relative with a history of pregnancy-related hypertension, overweight, carrying twins, or have a history of chronic diseases such as high blood pressure, diabetes, or kidney problems. Hypertension that is not handled properly bisaberdampak negative for your baby and yourself. Reduced blood flow to the placenta. This condition can make the baby does not get enough oxygen and nutrients. The fetus does not receive enough oxygen and nutrients can inhibit the growth of the fetus, infants born with low birth weight or premature birth. For the sake of saving the lives of you and the little one, sometimes the doctor will suggest birth prematurely. The trick with the induction or caesarean section. This is done to prevent eclampsia and other complications. It is a condition when the placenta separates from the uterine wall before delivery. If this is the case, you will be damaged placenta. You will also experience severe bleeding. Both of these could endanger the lives of you and your little one. This condition may occur during the five months pregnant or more. Baby died in utero due to not getting things needed, such as oxygen and nutrients, should babies conceived by mothers with normal blood pressure. If you've reached the stage praeklamsia, then you run the risk of cardiovascular disease after giving birth, especially if you give birth to a premature baby. But you can minimize the risk by living a healthy lifestyle after giving birth. 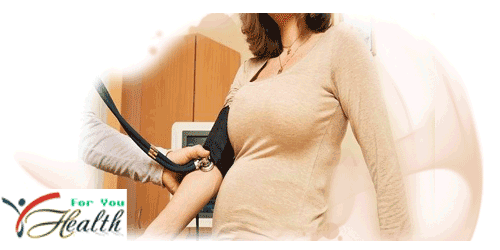 If you develop hypertension during pregnancy, keep your health properly. Regularly went to the gynecologist so that your condition is maintained. When you suffer from hypertension, the doctor will give you medication to lower your blood pressure. You do not have to worry about the drug will affect your fetus because there is some blood pressure-lowering drugs are safe for consumption by pregnant women. Also follow all instructions and drink the recommended dosage doctor. Do not stop taking or change the dose without the supervision of a doctor. Also avoid herbal remedies which, according to the trust can help lower your blood pressure without solid scientific evidence. Remember, pregnancy is a period prone to danger. Therefore always apply a healthy lifestyle during pregnancy, such as regular exercise , eating nutritious foods, such as vegetables, fruits, lean meats, and low-fat milk. Avoid foods containing high salt. Also avoid smoking and consuming alcoholic beverages.